Why we love it: Destroy germs with a clean conscience with this non-toxic, organic hand sanitizing spray from Dr. Bronner’s. 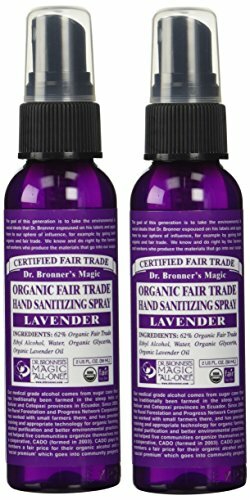 Organic Ethyl Alcohol and Lavender Oil work together to kill germs and bacteria while organic, plant-derived glycerin softens and hydrates hands. Perfect for on-the-go, airplane travel and all day use! Spray 1-2 pumps and rub into hands. Comes with 2 bottles.